« Guest post: On-field Opening Day experience! I'm going to run out of Frenchy pictures. People on Twitter have been making fun of Royals players who say “Y’know” for as long as people have been talking about the Royals on Twitter. This season, I’ll be keeping track of the player interviews on the Royals postgame show on FSKC so we can see quantifiably who the King of Y’Know really is. 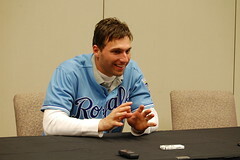 Only two locker room player interviews today…and Frenchy is once again the winner. You’re being unfair to the starting pitchers here; they only get interviewed once every five games as opposed to position players who might have a mike shoved in their faces several times a week. I say this because the person I’ve REALLY noticed as the king of “you know” is Luke Hochevar, and if he doesn’t win this it will only be for lack of opportunity.